Perioperative hypotension is one of the common clinical scenarios encountered by anesthesiologists and other perioperative physicians. With the aging patient population suffering from many coexisting diseases, the immediate and long-term implications of this hemodynamic perturbation can be significant. A common clinical scenario would be an elderly patient with multiple cardiovascular risk factors undergoing a surgical procedure, and developing hypotension and myocardial ischemia. The initial treatment often entails administration of intravenous fluids and vasopressors like phenylephrine. But what if the patient does not respond to these routine measures? Inappropriate or delayed treatment can lead to a cascade of persistent hypotension leading to worsening ischemia which in turn leads to worsening hypotension and so on. This tutorial is used to discuss the etiology and management of perioperative hypotension, with a special focus on myocardial ischemia. While intraoperative hypotension is a common occurrence in anesthetized patients, its true incidence is unknown. This uncertainty is largely due to the varying thresholds used to define hypotension by different investigators. In a recent article by Bijker et al., the authors estimated that the incidence of hypotension was 5-99%, depending on the blood pressure parameters used. Their analysis further concluded that 64% of the patients under anesthesia experienced episodes of systolic blood pressure less than 90 mm Hg and more than 93% patients had at least one episode of systolic blood pressure and mean arterial pressure that went more than 20% below the baseline. The exact and clinically relevant definition of intraoperative hypotension and its short and long-term implications remain controversial. In the previously cited observational study involving 1705 patients, the authors concluded that there is no clear relationship between hypotension (using any definition) and 1 year mortality after non-cardiac surgery. However, the sub-analysis of elderly patients demonstrated adverse effects of prolonged intraoperative hypotension on 1 year mortality. They also observed a trend toward increased hazard ratio for mortality if the systolic blood pressure or mean arterial pressure decreased 40% or more below the baseline. Monk et al. observed that 1 year mortality increased by 3.6% for every minute that the systolic blood pressure was less than 80 mm Hg. In a retrospective review of perioperative deaths, Lienhart and associates found that intraoperative hypotension and anemia were closely associated with postoperative myocardial ischemic events. Intraoperative hypotension has also been linked to non-cardiac complications and adverse outcome after surgery. The introduction of electronic anesthetic records may lead to a more objective assessment of the true incidence of hypotension during surgery. In an otherwise normotensive patient, most anesthesia providers would consider systolic blood pressure lower than 90 mm Hg or more than 20% below the baseline value as an acceptable definition of hypotension. The principles discussed in the following sections regarding intraoperative hypotension are also applicable to the diagnostic and therapeutic management of hypotension in the immediate preoperative and postoperative period. where CO = cardiac output, HR = heart rate, SV = stroke volume and SVR = systemic vascular resistance. Stroke volume is dependent on preload, afterload and contractility. Thus, the blood pressure can be considered as a function of heart rate, preload, afterload, contractility and systemic vascular resistance. 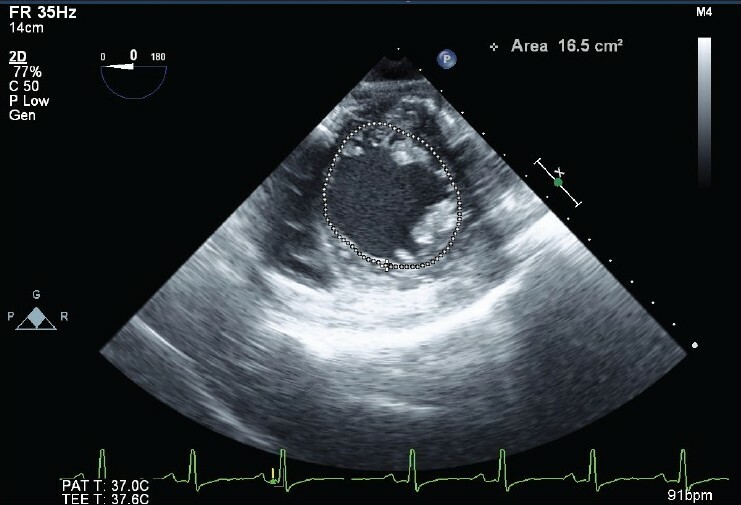 In the absence of any mechanical obstruction like hypertrophic obstructive cardiomyopathy or systolic anterior motion of mitral valve, afterload can be equated with systemic vascular resistance. [Table 1] summarizes many of the pathophysiologic conditions resulting in hypotension. 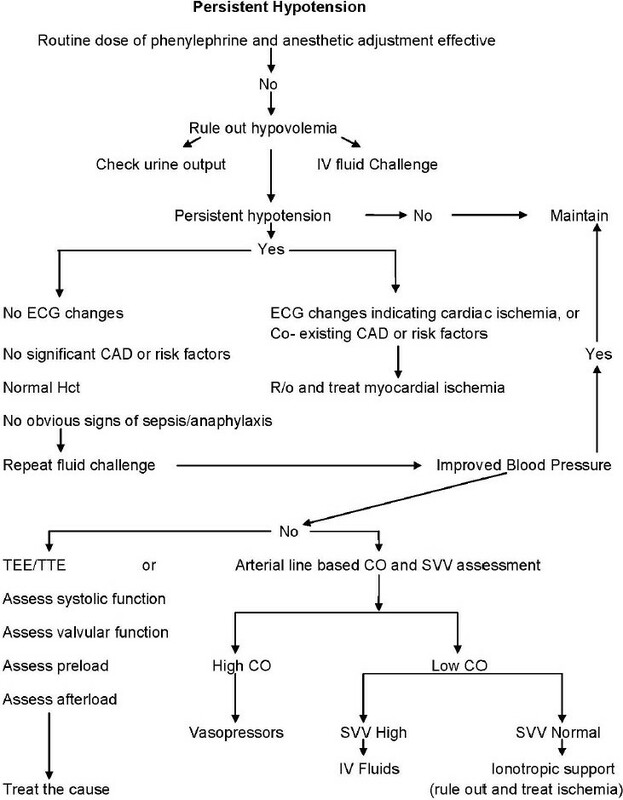 The algorithm in [Figure 1] can be used to guide the diagnostic and therapeutic approach to perioperative hypotension. Decreased vascular tone in conjunction with relative hypovolemia (e.g., hemorrhage) is the most common cause of intraoperative hypotension. The heart is capable of augmenting its contractile force and hence the stroke volume using Frank-Starling mechanism, if preload is increased. This reserve is exhausted sooner in the diseased or ischemic hearts. Hypotension that is unresponsive to volume and pressors requires further investigation. Specifically, myocardial ischemia must be considered in addition to other causes listed in [Table 1]. 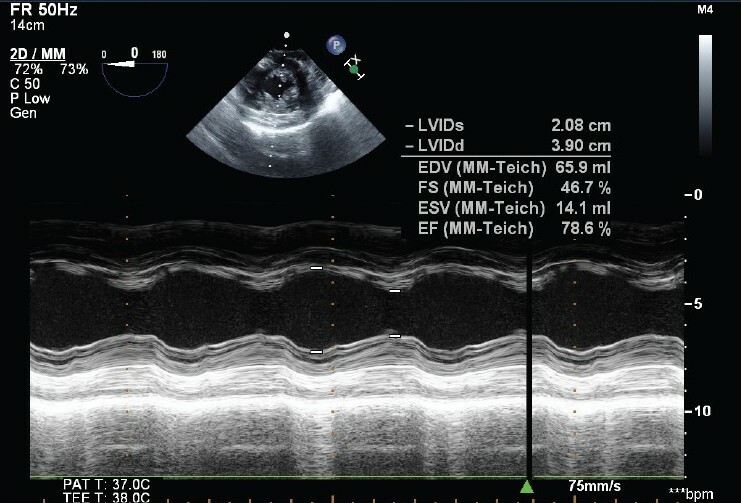 Echocardiography can determine the presence or absence of hypovolemia and contractile dysfunction [Figure 2] and [Figure 3]. Drug effects on heart rate, preload and afterload should be reversed if possible. Conditions that require a specific procedural intervention (pneumothorax → needle/tube thoracostomy; pericardial tamponade → pericardiocentesis) must be ruled out using appropriate imaging modalities (X-ray or echocardiography) if time and patient conditions permit. A significant number of people undergoing surgery have known coronary artery disease or have risk factors for coronary artery disease. The incidence of perioperative myocardial infarction (PMI) ranges from 1 to 17% with an associated mortality rate of 15-25%., The true incidence may be underestimated because of many silent/unrecognized PMIs. A patient's intraoperative course may be predictive of PMI development. For example, intraoperative hypotension has been associated with PMI., The emergence and early postoperative periods are the most likely times when myocardial ischemia can develop. In a prospective study of over 3500 patients undergoing non-cardiac surgery, Rinfret et al. demonstrated that detection of ischemia on the electrocardiograph in the immediate postoperative period was predictive of adverse cardiac outcome during that hospital stay In another study, the authors found the longer duration of ST segment depression to be closely associated with adverse cardiac events. Blood flow to the human heart is delivered by the left anterior descending, left circumflex and right coronary arteries via numerous small branches. Coronary perfusion pressure is determined by aortic diastolic and left ventricle end diastolic pressure as follows: coronary perfusion pressure = diastolic blood pressure - left ventricle end diastolic pressure. A high index of vigilance is warranted in patients with multiple cardiac risk factors undergoing surgery. Just as myocardial ischemia and infarction should always be ruled out if these patients present with chest pain or discomfort in the non-operative period, it should be considered if they develop persistent hypotension perioperatively. While there are many monitors available to detect myocardial ischemia, a number of these patients will suffer myocardial infarction (MI) without any detectable sign and symptoms. Incidentally, silent ischemic events carry the same prognosis as that of recognized MIs. The following is a summary of available techniques to monitor perioperative myocardial ischemia and their limitations. In a patient with cardiac risk factors, MI should be considered in the presence of chest pain, chest discomfort, shortness of breath and persistent hemodynamic instability. Not all ischemic episodes are clinically apparent though. In a pooled data from multiple studies, Devereaux et al. found that only 14% patients experiencing a PMI will have chest pain and only 53% will have clinical signs or symptoms that will trigger a work up for MI. In addition, the symptoms cannot be deciphered in a patient under general anesthesia. Myocardial ischemia is indicated by at least 1 mm ST segment horizontal or down sloping depression. T wave inversion may also indicate ischemia, although there are many non-ischemic causes of T wave changes. Computerized analysis of ST changes is more sensitive than visual inspection. Monitoring of ST segment trends may further enhance the detection of ischemic episodes. In a study of 105 patients with known or suspected coronary artery disease undergoing non-cardiac surgery, London et al. calculated that simultaneous monitoring of leads 2 and V5 can detect 80% ST segment changes. The sensitivity improved to 96% by combining leads 2, V4 and V5. The accuracy of automated ST segment trends is dependent upon the default measuring points, presence of preoperative electrocardiographic abnormalities, proper lead placement and probability of developing myocardial ischemia in a given patient. Myocardial ischemia reduces left ventricular compliance that results in increased pulmonary artery occlusion pressure and presence of V waves if papillary muscles are involved. Impaired systolic function can lead to decreased cardiac output and mixed venous oxygen saturation. The utility of pulmonary artery catheters in detecting perioperative myocardial ischemia and its positive impact on the clinical outcome have not been demonstrated clearly. Hypotension along with decreasing cardiac output can result from hypovolemia or ventricular dysfunction. Simultaneous measurement of stroke volume variation can rule out hypovolemia, leaving myocardial ischemia as a more probable cause in a patient with cardiac risk factors. Kungys et al. recently demonstrated that stroke volume variation derived from arterial pressure based system had an excellent inverse correlation with left ventricle volume measured with 3D echocardiography. The technique is not reliable in patients with cardiac arrhythmias, e.g., atrial fibrillation. The clinical utility of this monitor in detecting PMI has not been well studied yet. The development of new regional wall motion abnormalities is considered to be the first detectable change in the left ventricle during ischemia. Transesophageal echocardiography (TEE) changes are more common and more predictive of MI than electrocardiographic changes. Adams et al. demonstrated an excellent correlation between wall motion abnormalities detected by echocardiography and presence of MI. Persistent hemodynamic instability (not responding to treatment) of undetermined etiology is a level 1 indication for performing rescue TEE. However, non-ischemic causes of regional wall motion abnormalities (e.g., preload and afterload changes, conduction abnormalities) and requirement of special expertise and general anesthesia preclude its routine use as an intraoperative monitor. Transthoracic echocardiography can replace TEE in patients with contraindication to TEE or patients who are awake. Its utility can be limited by the image quality, lack of surface access to probe placement and lack of expertise among anesthesiologists. In summary, myocardial ischemia should be suspected in unstable patients with cardiac risk factors undergoing surgery. The routine use of the multiple lead electrocardiograms for ST segment and T wave changes is capable of detecting most episodes of ischemia. The diagnostic accuracy can be enhanced by the use of other invasive monitors, especially TEE. All suspected ischemic episodes should be followed up with cardiac enzyme (troponin) measurements. As mentioned previously, the etiology of PMI could be an imbalance of oxygen supply and demand or atherosclerotic plaque rupture and thrombosis leading to coronary artery occlusion. If ischemia is detected early in the intraoperative period before the surgical incision is made, the procedure should be delayed and patient stabilized by improving the oxygen supply and demand ratio and further course decided by the severity and nature of the underlying etiology. On the other hand, if surgery cannot be stopped, it should be expedited while the patient is stabilized by improving coronary blood flow and oxygen delivery and reducing oxygen demand. Further course of action will depend upon the underlying pathology and relative risk of surgical bleeding from any intervention. [Figure 4] can be used as a therapeutic approach to treat myocardial ischemia and infarction. The exact clinical significance of intraoperative and immediate postoperative hypotension remains unclear and needs to be probed further, although low blood pressure intraoperatively and its impact on postoperative mortality are emerging factors that need to be addressed. Identifying the predictors of perioperative myocardial ischemia and adverse cardiac events also remains a challenge. The commonly used Revised Clinical Risk Index criteria may not be very predictive of cardiac events in patients undergoing vascular surgery. In a meta-analysis of nine studies that included over 3200 patients, Karthikeyan et al. reported that preoperative brain natriuretic peptide levels are closely associated with cardiovascular outcome. The anesthetic and other preoperative strategies to reduce or prevent preoperative ischemic events also remain controversial. In a large-scale study of perioperative beta blocker use, investigators reported lower incidence of cardiac events at the risk of higher stroke and mortality rate. This study was conducted at multiple centers located in numerous countries and evoked criticism for using higher dosage of beta blocker, acute administration of beta blocker before surgery, increased incidence of hypotension in the treatment group and questionable ability to enforce uniform protocol at all participating sites. Zangrillo and colleagues reported the beneficial effect of perioperative esmolol usage in reducing PMI. Interestingly, esmolol was administered at different times during surgery, e.g., before intubation, after intubation, before surgical incision, etc. The precise role of beta blockers during surgery remains elusive. Statin and alpha-2 agonist use has also been linked to improved perioperative myocardial outcome., The role of volatile anesthetics in preventing or reducing myocardial ischemia in humans needs to be researched further. A meta-analysis of published data indicated the protective effect of volatile anesthetics in patients undergoing coronary artery bypass surgery but the evidence is not as strong for non-cardiac surgery. The ACC/AHA guidelines recommend maintaining general anesthesia with volatile anesthetics in patients at risk for myocardial ischemia, undergoing non-cardiac surgery. 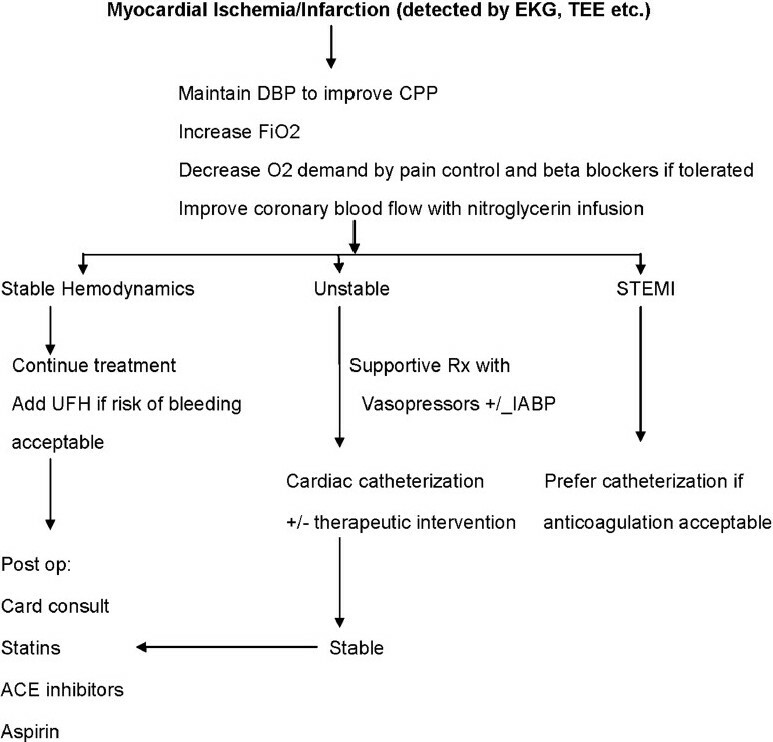 And finally, putting it all together for the prevention and the optimal treatment of perioperative myocardial ischemia remains a work in progress. 1. Bijker JB, van Klei WA, Vergouwe Y, Eleveld DJ, van WL, Moons KG, et al. Intraoperative hypotension and 1-year mortality after noncardiac surgery. Anesthesiology 2009;111:1217-26. 2. Monk TG, Saini V, Weldon BC, Sigl JC. Anesthetic management and one-year mortality after noncardiac surgery. Anesth Analg 2005;100:4-10. 3. Lienhart A, Auroy Y, Pequignot F, Benhamou D, Warszawski J, Bovet M, et al. Survey of anesthesia-related mortality in France. Anesthesiology 2006;105:1087-97. 4. Chang HS, Hongo K, Nakagawa H. Adverse effects of limited hypotensive anesthesia on the outcome of patients with subarachnoid hemorrhage. J Neurosurg 2000;92:971-5. 5. Poldermans D, Boersma E, Bax JJ, Thomson IR, Paelinck B, van de Ven LL, et al. Dutch Echocardiographic Cardiac Risk Evaluation Applying Stress Echocardiography Study Group: Bisoprolol reduces cardiac death and myocardial infarction in high-risk patients as long as 2 years after successful major vascular surgery. Eur Heart J 2001;22:1353-8. 6. Devereaux PJ, Goldman L, Cook DJ, Gilbert K, Leslie K, Guyatt GH. Perioperative cardiac events in patients undergoing noncardiac surgery: A review of the magnitude of the problem, the pathophysiology of the events and methods to estimate and communicate risk. CMAJ 2005;173:627-34. 7. Rinfret S, Goldman L, Polanczyk CA, Cook EF, Lee TH. Value of immediate postoperative electrocardiogram to update risk stratification after major noncardiac surgery. Am J Cardiol 2004;94:1017-22. 8. Landesberg G, Luria MH, Cotev S, Eidelman LA, Anner H, Mosseri M, et al. Importance of long-duration postoperative ST-segment depression in cardiac morbidity after vascular surgery. Lancet 1993;341:715-9. 9. Ambrose JA, Tannenbaum MA, Alexopoulos D, Hjemdahl-Monsen CE, Leavy J, Weiss M, et al. Angiographic progression of coronary artery disease and the development of myocardial infarction. J Am Coll Cardiol 1988;12:56-62. 10. Sametz W, Metzler H, Gries M, Porta S, Sadjak A, Supanz S, et al. Perioperative catecholamine changes in cardiac risk patients. Eur J Clin Invest 1999;29:582-7. 11. Indolfi C, Ross J Jr. The role of heart rate in myocardial ischemia and infarction: Implications of myocardial perfusion-contraction matching. Prog Cardiovasc Dis 1993;36:61-74. 12. Sautter RD, Myers WO, Ray JF, III, Wenzel FJ. Relationship of fibrinolytic system to postoperative thrombotic phenomena. Arch Surg 1973;107:292-6. 13. Ellis SG, Hertzer NR, Young JR, Brener S. Angiographic correlates of cardiac death and myocardial infarction complicating major nonthoracic vascular surgery. Am J Cardiol 1996;77:1126-8. 14. Cohen MC, Aretz TH. Histological analysis of coronary artery lesions in fatal postoperative myocardial infarction. Cardiovasc Pathol 1999;8:133-9. 15. Dawood MM, Gutpa DK, Southern J, Walia A, Atkinson JB, Eagle KA. Pathology of fatal perioperative myocardial infarction: Implications regarding pathophysiology and prevention. Int J Cardiol 1996;57:37-44. 16. Sheifer SE, Manolio TA, Gersh BJ. Unrecognized myocardial infarction. Ann Intern Med 2001;135:801-11. 17. Devereaux PJ, Goldman L, Yusuf S, Gilbert K, Leslie K, Guyatt GH. Surveillance and prevention of major perioperative ischemic cardiac events in patients undergoing noncardiac surgery: A review. CMAJ 2005;173:779-88. 18. London MJ, Hollenberg M, Wong MG, Levenson L, Tubau JF, Browner W, et al. Intraoperative myocardial ischemia: Localization by continuous 12-lead electrocardiography. Anesthesiology 1988;69:232-41. 19. Kungys G, Rose DD, Fleming NW. Stroke volume variation during acute normovolemic hemodilution. Anesth Analg 2009;109:1823-30. 20. Comunale ME, Body SC, Ley C, Koch C, Roach G, Mathew JP, et al. The concordance of intraoperative left ventricular wall-motion abnormalities and electrocardiographic S-T segment changes: Association with outcome after coronary revascularization. Multicenter Study of Perioperative Ischemia (McSPI) Research Group. Anesthesiology 1998;88:945-54. 21. Adams JE 3 rd , Sicard GA, Allen BT, Bridwell KH, Lenke LG, Dávila-Román VG, et al. Diagnosis of perioperative myocardial infarction with measurement of cardiac troponin I. N Engl J Med 1994;330:670-4. 22. Ford MK, Beattie WS, Wijeysundera DN. Systematic review: Prediction of perioperative cardiac complications and mortality by the revised cardiac risk index. Ann Intern Med 2010;152:26-35. 23. Karthikeyan G, Moncur RA, Levine O, Heels-Ansdell D, Chan MT, Onso-Coello P, et al. Is a pre-operative brain natriuretic peptide or N-terminal pro-B-type natriuretic peptide measurement an independent predictor of adverse cardiovascular outcomes within 30 days of noncardiac surgery? A systematic review and meta-analysis of observational studies. J Am Coll Cardiol 2009;54:1599-606. 24. Devereaux PJ, Yang H, Yusuf S, Guyatt G, Leslie K, Villar JC, et al. Effects of extended-release metoprolol succinate in patients undergoing non-cardiac surgery (POISE trial): A randomised controlled trial. Lancet 2008;371:1839-47. 25. Zangrillo A, Turi S, Crescenzi G, Oriani A, Distaso F, Monaco F, et al. Esmolol reduces perioperative ischemia in cardiac surgery: A meta-analysis of randomized controlled studies. J Cardiothorac Vasc Anesth 2009;23:625-32. 26. Schouten O, Boersma E, Hoeks SE, Benner R, van UH, van Sambeek MR, et al. Fluvastatin and perioperative events in patients undergoing vascular surgery. N Engl J Med 2009;361:980-9. 27. Wijeysundera DN, Bender JS, Beattie WS. Alpha-2 adrenergic agonists for the prevention of cardiac complications among patients undergoing surgery. Cochrane Database Syst Rev 2009;4:CD004126. 28. Landoni G, Biondi-Zoccai GG, Zangrillo A, Bignami E, D'Avolio S, Marchetti C, et al. Desflurane and sevoflurane in cardiac surgery: A meta-analysis of randomized clinical trials. J Cardiothorac Vasc Anesth 2007;21:502-11. 29. Fleisher LA, Beckman JA, Brown KA, Calkins H, Chaikof EL, Fleischmann KE, et al. ACC/AHA 2007 Guidelines on Perioperative Cardiovascular Evaluation and Care for Noncardiac Surgery: Executive Summary: A Report of the American College of Cardiology/American Heart Association Task Force on Practice Guidelines (Writing Committee to Revise the 2002 Guidelines on Perioperative Cardiovascular Evaluation for Noncardiac Surgery) Developed in Collaboration With the American Society of Echocardiography, American Society of Nuclear Cardiology, Heart Rhythm Society, Society of Cardiovascular Anesthesiologists, Society for Cardiovascular Angiography and Interventions, Society for Vascular Medicine and Biology, and Society for Vascular Surgery. J Am Coll Cardiol 2007;50:1707-32. 9 An unexpected left atrial cavernous hemangioma:The cardiac surgeon needs an optimal preoperative study! López, M.T.G., Granados, P.J.A., Segura, L.D., de Loma, J.G.